NICE has published a report examining progress made by the healthcare system in implementing its guidance. 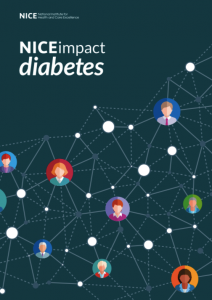 The ‘NICEimpact diabetes’ reviews how the organisation’s recommendations for evidence-based and cost-effective care are being used in priority areas of the health and care system to improve outcomes. The report focuses on preventing type 2 diabetes, where it discusses the Healthier You: NHS Diabetes Prevention Programme (NDPP), and managing diabetes, examining the nine care processes, including eye screening. There is also a spotlight on insulin pump therapy. Speaking about the NDPP, he added: “One of the most heartening parts of diabetes in the last few years has been the extraordinary progress of the NHS Diabetes Prevention Programme. This is on course to reach 100,000 people a year by 2020 and early results show that it is having the effects on weight loss and take-up that we hoped for at the outset.